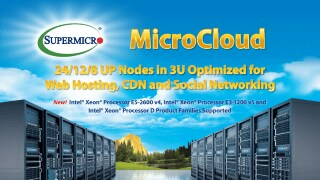 MicroCloud Solutions | Super Micro Computer, Inc. The Supermicro MicroCloud modular server system provides the high density, high performance, high efficiency and cost effectiveness required for cloud computing infrastructure. Up to 24 server systems (nodes) are conveniently integrated into a compact 3U chassis that is only 23 inches deep. 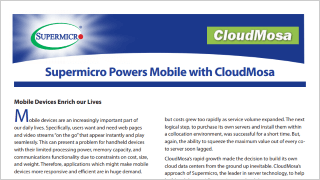 The Supermicro MicroCloud systems are optimized for cloud computing providers, data and web hosting, HPC, data centers, compute intensive applications, virtualization, and data farms.